The junior bantam Cowichan Bulldogs lost a nail-biter against the Harewood Dawgs last Sunday as they were edged 31-30 at McAdam Park. The Bulldogs played a strong game on both sides of the football, but they didn’t have an answer for the one Harewood superstar player who accounted for all of the Dawgs’ big plays, and every one of their points. Cowichan’s big plays included an interception by Jesse Kwasny that he ran back for a touchdown. Jordan Russell scored the rest of the points on a combination of kickoff returns and long runs. The peewee Bulldogs also lost to their Harewood opponents, playing another strong game, but struggling to contain the Dawgs’ outside game. Filling in for the injured Cayden Summers at quarterback, Ryder Maertz scored the Cowichan peewees’ first touchdown of the year, breaking a tackle and getting a clear run to the end zone off a big block by Conner Smith. Maertz attempted a pass to Lennex Weber for the two-point convert, but it was negated by pass interference. After the penalty call, Zoe Billings caught the next attempt. Jayden (Dozer) Strom-Bell had the hit of the day, knocking down Harewood’s biggest kid when the opposing player tried to stop him in a kickoff return. The peewee and junior bantam Bulldogs will play their last regular-season games this Sunday against the Lions in Nanaimo. 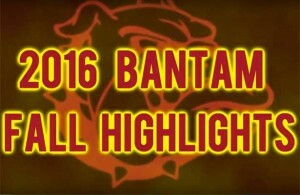 The bantam Bulldogs saw their game against the Salmon Arm Chargers slip away in a 28-21 loss, and with it any hopes they had of hosting a playoff game. The Bulldogs jumped out to an early lead on 60- and 30-yard touchdowns from Alex Marinakis, but the score was tied at 14-14 by halftime. After Salmon Arm took the lead, Dakota Cullum’s 40-yard touchdown reception tied the score at 21-21 early in the fourth quarter. The Bulldogs fell behind once again,then with two minutes left got the ball to the Chargers’ 40-yard line, but the Hail Mary was knocked away. The Bulldogs lost their chance to finish in the top two and host a playoff game, but they could still capture a spot in the postseason. The winner of this Sunday’s game in Comox between the Bulldogs and the Raiders will finish fourth in the league and lock up the last playoff berth.